It's about ten minutes to midnight, long past throwing-out time, and oblivious to the menacing stare of the landlady - but to the delight of the capacity crowd - Nick Harper is standing heroically on a table, maniacally thrashing out chords on his long-suffering Lowden like a man possessed. It's an unexpected yet oddly fitting end to what by any standards has been a weird night of acoustic mayhem. 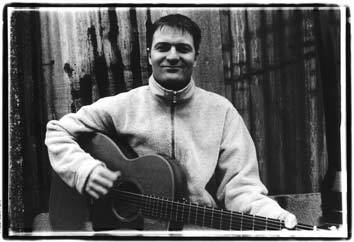 At times winsome, at times like some crazed amphetamine-fuelled psychobilly version of Martin Carthy, Nick Harper is not a man upon whom musical labels stick easily. To most of us a Nick Harper set list - including, perhaps, songs from such diverse sources as Frank Zappa, Elvis Presley, Led Zeppelin, Killing Joke and Monty Python - might seem wilfully schizophrenic, even a musical minefield. But to Nick, it's all part of his musical master plan. "I don't align myself with any musical manifesto - it's just a personal expression of what I feel at any particular time," Harper explains. "I've been accused of being a 'musical hippie', but I wouldn't call Zappa a hippie - he's a genius, a one-off. I don't subscribe to labels and I'll take from anywhere if I think the song fits. I've plundered from Killing Joke, Gang Of Four, The Prodigy... and it may not be fashionable, but I love Stephen Stills. He's a big influence. "Then I do another song with a bit of Jerry Reed's Guitarman, a bit of Led Zeppelin and some Gustav Holst all thrown in - I like to mix it! A lot of people might laugh at the idea of doing a song like Guitarman, but the lyrics are great. What's more, it's an entertaining song, which at the end of the day is what I'm about. Too many singer/songwriters are tainted with this whole idea that they're introspective and a bit down, which is why I constantly try to be an entertainer and provide a real show. "Having said that, I do have my serious moments; I'm about sharing, and ideally I'd like people to think the same way that I do about Green issues and politics. You can't just beat people over the head with ideas - they want entertainment - but I do like to get heavy from time to time. There's things going on in our world that are completely bizarre, evil and wrong, and I think that you should say how you think about them." "Being 'the son of' is one of those things that's a bit of a curse, and apart from Jeff Buckley - one of the few who was arguably more talented than his father - the kids of famous fathers can have a hard time," muses Harper. "They're bound to be judged in the light of what's gone on before. But there are advantages, too. I was exposed to everything, got onstage at the Royal Albert Hall when I was a nipper, and met all my dad's famous friends.... even if I was too small to remember. "I always knew that he was different than other dads, but at the time that was normal for me. Looking back I realise that it was a strange world to be in, but that was my world, He wasn't around that much, mind, so that has probably more influence on me than the fact that he was famous. If I'm honest, though, it's opened - and shut - a lot of doors for me." Although Roy Harper's laid-back, spliffed-out stage persona is the stuff of legend, Nick's is coming from a quite different planet. Right now it's getting close to showtime, and Harper has become obsessed with a buzz emanating from the sinister-looking black trunk housing his various gizmos. After fearlessly doctoring the insides with a screwdriver whilst the device is still switched on, he then insists that the luckless soundman remove the grills from a PA speaker. "I do occasionally blow up PAs - the bass string on my guitar goes down to about 55Hz, so the drivers have to be a certain size or they just can't handle it," he grins. "I've blown limiters before, but I can't actually remember blowing a speaker up!" "Oh, no," says Harper, shaking his head. "Actually, I used to spend a lot of time thrashing a Les Paul in my bedroom at extremely high volume, and I was in a few electric bands at school, but in general if the sun's shining and there's a bit of light around, I prefer my acoustic. I've always played one: there was always one lying around at home, and it was natural for me to pick it up and bash it around. "A lot of my joy of music comes from sitting in my kitchen just strumming away. The heart of the song appears in the kitchen - occasionally it happens onstage, but mostly it's in the kitchen! Making something up from scratch is a wonderful thing to do in any art form, whether you're building a house or writing a song. "I do love being loud, though. There's a place for quiet acoustic music, but I like to have every colour available. Some of the things I play are really funky and nasty, but sometimes I like to be able to play with a light touch, too." Like everything else about him, Harper's Lowden is not quite what you might expect. "My guitar's a bit of a monster," he laughs. "It's tuned down to a low A with a .66 on the bottom, then I use a 53, 39, 24, 16, 13, which gives a massive sound. I use open tunings a lot - DADGAD, open D, dropped G, GGGGBD, and one that's open D with the top two strings up - so I've had banjo tuning pegs fitted. "I got the idea from Adrian Legg who uses them and I thought, fantastic, this'll get me over those open mic nights at the folk club where you're tuning up - dong, dong, dong, dong, dong, daa - and everyone's saying 'Come on..!' They're very pricey, the tuners, but they're worth it... plus you can mess around with tuning even right in the middle of songs. "I started out playing a bit of lead onstage with my old man but over the years his voice has gone down, and he's taken his guitar tunings with him. It made sense to have my guitar in the same tuning so I knew where I was, so when I started writing songs of my own, it seemed natural to use those same tunings. If I tuned it up to concert I wouldn't be able to sing a single song, because I use every last drop of range that my voice will let me. "My guitar goes through an Alesis Quadraverb II, and I've got a few MIDI pedals that I use for delay times and stuff. I've got a Line 6 Delay Modeler which I use to layer the vocals... it gets quite a good sound going sometimes. But I prefer to be loose - that's probably why I'm not in a band, let alone feeding them all and housing them all. I'm all for gadgets and gizmos as long as they're just not there for the sake of it. "Most of my gigs are pretty much on the fly. I start out with a loose script and develop it as I'm going along. It's an organic thing, and it just seems to grow all by itself. I really enjoy playing live and meeting new people; it's a great privilege, and I'm here for the duration. After all, I'm bugger all use at doing anything else. "But I still get nervous when I go on. I think it's human. You're no better than anyone else in the room... you're just the one that happens to be doing it. I see no reason to have to hide that kind of emotion."